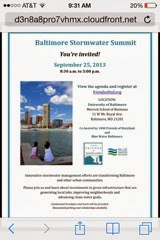 Yesterday I had the pleasure of attending the Stormwater Summit in Baltimore. I heard something there, the same thing I said this summer: the desire for a $5 crab cake. There is only one way that will ever happen again, and that is only when there is enough clean water for the grasses to grow in the Chesapeake Bay. The crabs need to hide in them, and the only way that can happen is for all water entry points to reduce how much goes into the bay. There are programs all over the place to reduce the amount of agricultural runoff. The big farms had to build and be in compliance years ago, now the focus is on mid-size farms and efforts to keep the smaller creeks and streams clean. In urban areas, the roofs, streets and sidewalks cause incredibly heavy runoff into every little and large waterway. When we leased land for farming (in Baltimore County) the small river turned into a massive flood on a regular basis, the first time we lost hundreds of birds, after that we had our pens in a different location. All up and down the waterways the rush of water occurs. The focus of yesterday's conference was on methods to slow the water down, keep it in place, use it for something else rather than dumping into streams. The erosion caused by this fast moving water causes lots of sediment in the bay, which also contributes to loss of bay grasses. Solutions under way are just beautiful. Rather than building massive tunnels and holding areas there are designs to change water catchment systems. Rain gutters to planters. Pervious sidewalks and roads. Angled parking with corner plantings that have deep, stone filled channels beneath. Budgets for building from a variety of sources, local, county, state and federal. The next 10 years promises a very different landscape. The EPA has set standards and is supporting the expansion of water catchment and diversion systems. Selection of plant materials is moving to many more native varieties. From the plans, urban settings will not lose parking places, just by angling the number of spots remains the same. Studies have shown that trees on a street change the culture of a street. Trees absorb rain and create breezes. The shade offered, the cooling effect in summer slows everything down. The less of a heat sink the happier the residents. There are thousands of acres that need runoff reduction in every jurisdiction here in the northeast. Great solutions and ideas were shared yesterday. Things I had not thought of were discussed. Truly inspiring.